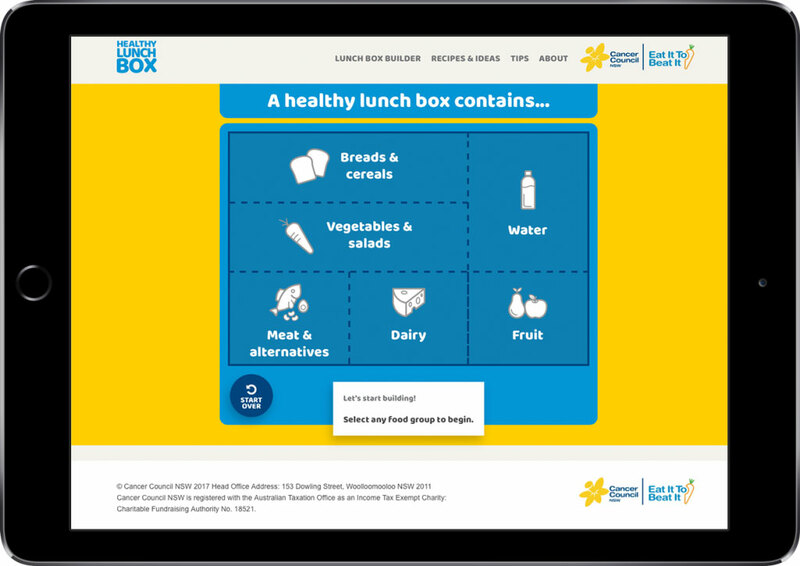 Cancer Council NSW approached us wanting to create a website that would help parents make informed choices about what they pack into their children’s school lunch boxes. As one of the leading health charities, Cancer Council wanted to educate parents and children about how easy it is to add more fruit and vegetable into their diets while encouraging behaviour which has lifelong cancer prevention benefits. Our solution was to build a website featuring an interactive tool – the ‘Lunch Box Builder’ which encourages parents and kids to sit down together and ‘build’ a healthy lunch in a fun and engaging way, while educating around serving sizes and nutritional information, and providing tips and recipes for the whole family. Over 4 weeks we undertook a discovery and research process in order to immerse ourselves in the customer problem space and uncover potential solutions, followed by 2 months of a full product build. We conducted workshops and interviews with parents of school aged children to understand the key incentives for using the ‘Lunch Box Builder’. What made the product unique was that coming from the Cancer Council, a not for profit focusing on health and cancer prevention, the website was seen as an unbiased and trusted source. It was important to us and the client that the tool was also used as a way for parents to bond with their children, and get them on board with healthy eating in a fun and convenient way. You can experience the Healthy Lunch Box website yourself here.